It was odd, if not downright uncomfortable, to watch Le Nozze di Figaro at the Metropolitan Opera. Certain allegations and newspaper articles floated through the air. But discomfort leads to growth, and opera, like all art, can be both a catalyst for painful change and a salve. The Count approached Susanna, his employee. He attempted to seduce her. She resisted; he pursued. She utilized her wit; he exploited his power. While in the past, these figures may have crackled with comic charisma, last night’s performance felt more menacing, more distinctly creepy. Reality’s dark undercurrents pulled one’s thoughts toward our contemporary headlines. While the unfortunate contexts I coyly allude to are nothing to celebrate, it’s worth pointing out the inexhaustibility of Mozart and Da Ponte’s art. The opera, composed in the late eighteenth century, wrestles with the most salient concerns of the twenty-first. Despite our cultural evolution, opera, as an art form, remains an apt lens through which one might view the pressing social problems of our modern world. While one considers the ubiquitous cases of sexual exploitation in the workplace, seething across newspapers and television screens, the character Susanna takes central focus within a reading of Le Nozze di Figaro. One can imagine her face placed between Ashley Judd and Taylor Swift on the cover of Time’s recent Person of the Year issue. Suddenly, her perspective is foregrounded and made alarmingly prescient within a national dialogue of consent, exploitation, and sexual politics. As the opera had its season premiere at the Met, Christiane Karg made a propitious debut as this central figure. Her gorgeous, incandescent soprano highlighted a role that one might easily forget. Where others have been cloying and tacky as the Countess’ maid, Karg was charismatic, fresh, and realistic, spontaneously playing each scene for its dramatic intent: her primary concern seemed to be the work of storytelling, not soliciting attention from the audience via cutesy antics. And, fortunately, Karg proved the rule, not the exception. Adam Plachetka was a graceful, endearing Figaro. And Serena Malfi was commendable for her droll Cherubino—something of a white whale among pants roles: a mezzo who actually acted like a boy. Maurizio Muraro and Katerina Leoson seemed to be having well-deserved fun as Dr. Bartolo and Marcellina. And special attention should be paid to Hyesang Park, a member of the Lindemann program, whose pliant, silvery soprano enlivened the minor Barbarina. Even Robert McPherson managed to elevate a trivial role like Don Basilio to something lyrically elegant and funny. As the count, Mozart’s iteration of our current cultural antagonist, Luca Pisaroni handled the various constituent (and often contradicting) character traits with agility. Beyond the buffa he brought to the opera, foolish and vain, he also handled the character’s more violent and erratic outbursts with satisfying malevolence. The beauty and mettle of his bass-baritone merely bolstered his adept dramatic work. In his excellent performance, one could easily locate the antecedent of our current ideas regarding toxic masculinity. 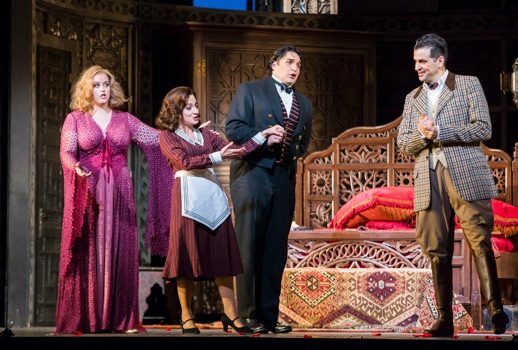 Le Nozze di Figaro is an ensemble show; and each member of the Met’s cast built an authentic, original character. While figures like Count Almaviva and Figaro may participate in the genre of stock characters, familiar from commedia dell’arte, the entire ensemble pushed against these received forms, and expanded notions of what a Figaro, Cherubino, or Basilio might be. This was especially true regarding the chemistry between Sørensen and Karg as the Countess and Susanna—two women, from vastly disparate socio-economic spheres, who manage to bridge their gaps in an act of (dare I say) radical solidarity. Much like women of the #MeToo movement, their mutual care and respect proved a secret weapon against the surveillance and oppression of the Count’s patriarchal privilege. These women, through their wit and devotion, proved a potent combination, rendering the Count’s vanity and disrespect laughable and silly. That being said, the final act of Sir Richard Eyre’s luxurious production was a tonic for the weary soul, a magical garden of mystery and illusion. The return to nature conjured the wild, topsy-turvy sphere of the forest—the domain of radical reconfiguration, familiar to the genre of comedy. Here, as the Count pursued the means of his exploitation, he discovered in its end what he had been searching for all along—the Countess, his wife, and forgiveness. “Contessa, perdono”: he supplicated. Her response? “Più docile io sono,/ E dico di sì.” I am kinder than you, and I say yes. Certainly, the Count should have also offered an apology to Susanna; she, perhaps even more than the Countess, suffered his abuse of power. While Mozart and Da Ponte elided this reconciliation, the Count’s shift in attention was a striking moment of self-recognition, and it indicated toward a more detailed self-reckoning. Forgiveness is a continuous process, a living amends. So, how shall we ask for forgiveness? How shall we learn to be kinder? The Almavivas’ reconciliation points toward the difficult conversations our own culture will have to have within the coming years. Forgiveness like this cannot be demanded, nor can it be offered officiously. It must come from the mystery of radical love, a mystery that has seemed illusive in the last weeks. Le Nozze di Figaro explicates this idea with elegance and wit, ultimately defining itself as a comedy, despite the intense emotional stakes. And again, one wonders if the way forward may involve a glance back to the past, toward the inexhaustibility of genius. I believe it will; and I hope it will help us imagine and create a more just future.